Patented SportClips and Pro Sound Isolating Eartips provide a secure, customized fit that won't interfere with eyewear or helmets iSport Immersion: The Athlete's Headphone by Monster For those serious about their game or their workout, Monster delivers the ultimate high-performance sport headphone. 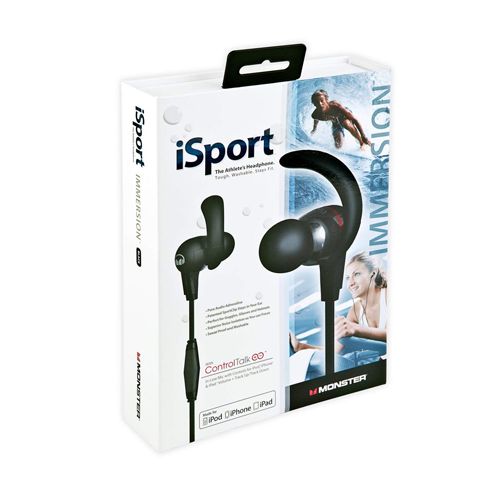 iSport Immersion was designed to meet the specific demands of today's top athletes. It's rugged, sweatproof and totally machine washable. The Pro Sound Isolating Eartips ensure an impenetrable seal blocking out water and leaving in that deep, pulse-pounding sound. Whether you're running, biking, or snowboarding, you'll go further and never lose focus, thanks to iSport's revolutionary in-ear SportClip design. Secure and comfortable, it won't fall out or get in the way of your goggles, glasses or helmet. If music is what moves you, iSport Immersion is the ultimate motivator. 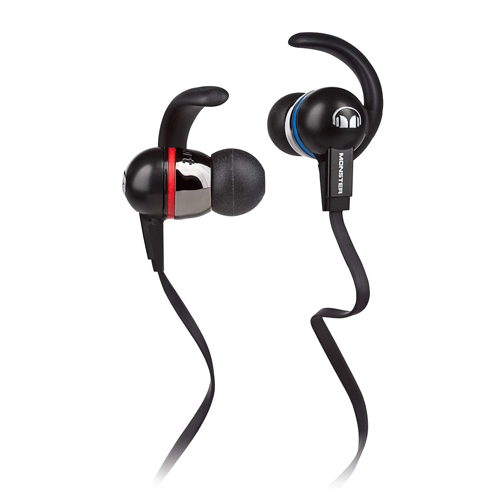 Its advanced in-ear speaker and MicroStrand Conductors turn your tunes into pure audio adrenaline. Powerful, clear and full of detail, you're in the zone. Go ahead and dominate. Advanced In-Ear Speaker Design with OmniTip Delivers true Monster-quality sound while the OmniTip swivel nozzle and patented SportClip provide a no-fail fit worthy of your toughest workout. Proprietary Waterproof Sealed Housing Beach. Mountains. Take your iSport headphones anywhere including the laundry room. It's washable! MicroStrand Conductors Listen to your tunes reproduced in dramatic detail. With iSport, you'll go the distance without ever missing a beat. Magnetic Flux Tube Technology The same technology found in Monster's best speaker cables are now in the ultimate sports headphone. 24K Gold-Plated Contacts Attractive and anti-corrosive for maximum audio signal. From now on, your favorite tracks will sound as good as gold. Convenient Right Angle Jack Move freely with your tangle-resistant cord and jack safely out of the way. Protective Clasp Pouch Tuck away your earphones when finished and carry them easily. Pro Sound Isolating Eartips Multiple sizes and shapes for the perfect fit blocking out sweat and noise so you can always focus on winning. ControlTalk On-Cable Mic Take the call without stopping iSport comes with convenient, hands-free calling for your iPhone or smartphone.